When selecting a steel material for a particular application, user has to be confident that it will be suitable for the loading conditions and environmental challenges it will be subjected to while in service. Understanding and control of the properties of the steel material is therefore necessary. Further properties of steel can be controlled through different processes such as hot and cold working, heat treatment etc. There are many measurement systems used to define the properties of given steel. These measurement systems normally come under four categories. These are physical properties, chemical properties, microstructural properties and mechanical properties. The physical properties of steel are related to the physics of the material, such as density, thermal conductivity, elastic modulus, Poison’s ratio etc. Typical physical properties of steels are given in Tab 1. Iron is the basic component of steel. When carbon (C), a nonmetal, is added to iron (Fe) in amounts up to 2.0 %, the result is an alloy known as steel. Composition of steel mainly consists of iron and other elements such as carbon, manganese, silicon, phosphorus, sulfur, and alloying elements. A large number of elements in wide ranging percentages are used for the purpose of alloying of steels. Variations in chemical composition of steels are responsible for a great variety of steel grades and steel properties. Each element that is added to the basic steel composition has some effect on the properties of the steel and how that steel reacts to the processes of working and fabrication of steels. The chemical composition of steel also determines the behaviour of steel in different environments. Steel standards define the limits for composition, quality and performance parameters for various steel grades. For determination of chemical composition either instrumental analysis by the use of optical emission spectrometer (OES) or wet analysis methods are used. Chemical composition also determines the carbon equivalent (CE) which is a useful parameter in determining the behaviour of steel during the process of welding of steel. The two popular formulas used for CE are given below. Austenite or ?-iron phase – Austenite is a high temperature phase and has a face centered cubic (FCC) structure (which is a close packed structure). ?-iron is having good strength and toughness but it is unstable below 723 deg C.
Ferrite or ?-iron phase – It is relatively soft low temperature phase and is a stable equilibrium phase. Ferrite is a common constituent in steels and has a body centered cubic (BCC) structure (which is less densely packed than FCC). ?-iron is soft , ductile and has low strength and good toughness. Pearlite is the ferrite-cementite phase mixture. It has a characteristic appearance and can be treated as a micro structural entity or micro constituent. It is an aggregate of alternating ferrite and cementite lamellae that degenerates (“spheroidizes” or “coarsens”) into cementite particles dispersed with a ferrite matrix after extended holding below 723 deg C. It is a eutectoid and has BCC structure. It is a partially soluble solution of Fe and C. It has high strength and low toughness. In case of non-equilibrium solidification of steels the following main micro structures may be formed. Bainite is a phase between pearlite and marten site. It is hard metastable micro constituent; non lamellar mixture of ferrite and cementite on an extremely fine scale. Upper bainite is formed at higher temperatures has a feathery appearance. Lower bainite is formed at lower temperatures has an acicular appearance. The hardness of bainite increases with decreasing temperature of formation. It is having good strength and toughness. Martensite is formed by rapid cooling and is hard and brittle. It is super saturated solution of C atoms in ferrite. It has a bct structure and a hard metastable phase. It has lath morphology when < 0.6 wt % C and plate morphology when > 1.0 wt % C and mixture of those in between. It is having high strength and hardness and low toughness. Mechanical properties of steels are defined as the reaction of the steels to certain types of external forces. Steel standards define the limits for different mechanical properties for various steel grades. These standards also specify the methods for preparation of testing samples and the procedure for testing. The following are the mechanical properties which are applicable to steels. Tensile strength (TS) – It is the maximum force that the steel material withstands before fracturing. It is also called ultimate tensile strength (UTS). This is usually reported in terms of force per unit of area (newtons per square millimeter). Yield strength (YS) – It is the force that the steel material can withstand before permanent deformation occurs. It is also reported as force per unit of area (newtons per square millimeter). Proof load testing – It is often used interchangeably with yield strength. It refers to the tension-applied load that a test sample must support without evidence of deformation. Ductility – It is the ability of the steel material to deform without fracturing. It is normally reported in percentage as elongation and reduction of area in a cross section that has been purposely fractured. Hardness – Hardness is the resistance of the steel material to penetration. 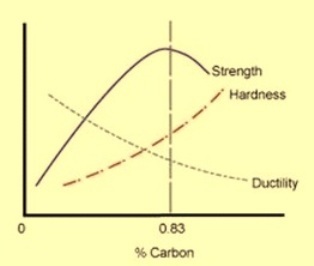 It is different from hardenability which is a measure of the ability of the steel to respond to heat treatment. Hardness is measured by applying a standard force to the surface of the steel through a small, hardened ball point, and then measuring the diameter of the resulting impression. Hardness usually is reported as a value on one of two industry standard scales, Brinell or Rockwell. Brinell hardness is usually more accurate for measuring hardness of plate products. Impact strength – It is the ability of the steel material to withstand a high velocity impact. Impact strength is measured by subjecting a standard notched sample to a swinging weight. As it is often important to know how the steel will perform in colder environments, this test is often done at sub-zero temperatures. Known as a notch test or Charpy test, the testing requires three standard samples of a defined grain orientation. The results are reported as joules, showing the average of the three specimens and the lowest value of the three, at the testing temperature. Torque test – Torque is the angular force required to turn something. It is the tendency of a force to rotate a steel object about an axis. Torque testing is accomplished by inserting a torque transducer between the tool applying the force and the item against which the force is being applied. There are two different approaches to torque measurement namely reaction and in-line. In-line torque testing measures the torque required to turn the rotating part while reaction measures the amount required to prevent the part from rotating. Fatigue testing – It is performed on steel parts to simulate the progressive and localized structural damage that occurs when steel material is subjected to cyclic loading. Fatigue is the weakening of the steel material caused by repeatedly applied loads. It is the progressive and localized structural damage that occurs when the steel material is subjected to cyclic loading. The nominal maximum stress values that cause such damage may be much less than the strength of the material typically quoted as the UTS limit or YS limit. Bend test – It determines the ductility or the strength of the steel material by bending the material over a given radius. Shear Testing – Shear strength measures steel material’s response to shear loading, a force that tends to produce a sliding failure on the steel material along a plane that is parallel to the direction of the force.